Finisterre’s emerging markets macro UCITS strategy won The Hedge Fund Journal’s UCITS Hedge award for best risk-adjusted returns over a three-year period ending in 2016, in the emerging market macro category. Finisterre was founded in 2002 and the firm, which runs approximately $3 billion and belongs to The Hedge Fund Journal’s “Europe 50” ranking of the largest 50 hedge fund managers in Europe (including the UK), launched the UCITS in 2013. Its investment objective is to generate absolute returns, while controlling volatility, within a robust risk framework. While Finisterre does run separate long-biased EMD strategies, the macro UCITS strategy has no long bias nor any requirement to generate positive carry. It can be net short, and/or can run with negative carry. 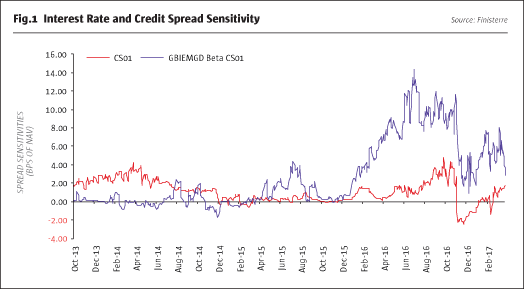 For most of its history since 2013, the strategy has stayed within a relatively narrow range of interest rate, and credit spread, sensitivity as shown in Fig.1. Like all Finisterre strategies, the macro UCITS employs an active and unconstrained investment approach, and for this strategy benchmarks or indices are not relevant. Thus the strategy has a broader, and more flexible, mandate than some emerging markets UCITS strategies. It employs a dynamic and opportunistic mix of long, short and relative value trades, taking views on individual countries’ government bond, interest rate, currency and occasionally equity, markets, in both emerging and developed economies. How well does UCITS fit macro? The breadth of the remit may be shared with some macro hedge funds, though few of them have UCITS vehicles. Finisterre’s macro UCITS strategy may help to dispel some potential misconceptions around UCITS: namely that the UCITS structure precludes concentrated portfolios; restricts managers to plain vanilla instruments; and forbids investments in esoteric markets. Some allocators may be surprised to learn that the Finisterre strategy can have position sizes of 35% (or more for OECD government debt); can invest in some relatively exotic instruments such as GDP-linked warrants issued by Greece or Argentina; and could hold (albeit smaller) positions in some of the more liquid “frontier markets” within the emerging market space (including debt issued by Ukraine, the United Arab Emirates, and some sub-Saharan African nations). All of these positions are permissible, as long as they are sized appropriately to fit within the strategy’s liquidity framework. Consequently, the strategy has often been somewhat more diversified than other Finisterre funds, in order to stick within UCITS liquidity criteria, and would not trade bank loans for the same reason. The UCITS strategy’s approach to macro investing is consistent with the UCITS IV regulations, which have been analysed and unpicked by Finisterre’s internal Regulatory Trading Officer, its Legal & Compliance Team and external legal advisors. Explains co-portfolio manager, Ed Lynch: “The UCITS rules allow for a lot of freedom in expressing macro strategies and we believe our understanding of the rules gives us a competitive edge.” Though some nuances and niceties of the rules are beyond the scope of this profile, in broad terms the 5/10/40 diversification rule (capping position sizes at 10% of NAV and limiting those positions of 5% or more to 40% of the NAV) does not apply to sovereign debt, a core asset class for fixed income house Finisterre. For sovereign debt, 35% of NAV applies in general, however for a specific list of sovereign issuers more exposure may be gained subject to certain conditions. The strategy can also trade non-sovereign debt, which may include quasi-sovereigns, such as state-owned or state-guaranteed enterprises, as well as traditional corporate debt. The UCITS could, as well, trade inflation-linked government or corporate debt. The macro UCITS strategy makes extensive use of derivatives, for long, short and hedge positions in rates, bonds, currencies, and equities. Instruments used include credit default swaps (CDS), credit indices, futures, forwards, swaps and options. These can be traded on exchanges and/or over the counter (OTC). Finisterre’s wide network of counterparty relationships, including local banks in emerging markets, help to source liquidity. Both developed and emerging markets are within the fund’s remit for several reasons: “Distinctions between emerging and developed markets are becoming blurred; trade themes may first appear in the G10; and developed markets can be efficient hedges,” illustrates co-manager, Bertrand Lavigne. The UCITS pursues three broad trade categories, which typically consume roughly even risk weightings although any can be accentuated or downplayed as per the opportunity set. “Relative value trades generate a good Sharpe ratio with long holding periods but they can be time consuming to implement and only make sense when dislocations throw up opportunities,” explains Lavigne. 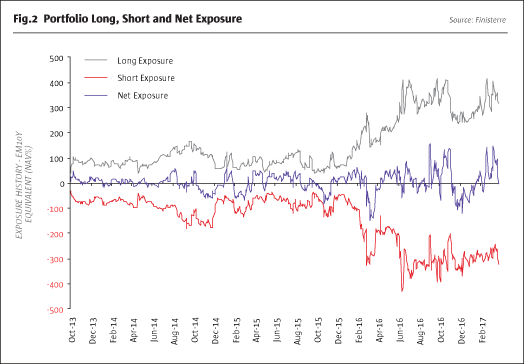 In contrast “the second type, tactical trades, are more short term and based on positioning flows,” he adds. Traditional, directional macro positions are the third trade type and they usually have a medium-term time frame, in between that of the first two. The opportunistic mentality means that both gross, and net, exposures have ranged widely, as shown in Fig.2. Lynch acknowledges that UCITS restrictions on shorting physical bonds do rule out some forms of credit (or relative value macro) strategies that seek to avoid basis risk between long and short books, and those that aim to construct calendar spread, or yield curve, trades. Some of the 11 portfolio managers at Finisterre count these sorts of trades in their repertoires, but Lynch and co-manager Bertrand Lavigne’s careers have revolved around FX and rates. Lynch spent over 10 years at Morgan Stanley trading plain vanilla and exotic FX options in London and Asia, rising to head the desk and trade with the bank’s own capital. Lavigne joined French bank CIC in 1995, trading in Singapore before moving to BNP Paribas in London and Singapore, where he became Head of Trading for Asian FX, Rates and Credit. Their skill sets are complementary with Lynch more expert in FX while Lavigne focuses more on rates. As such, the two can discuss how to optimise the expression of trade ideas according to factors such as liquidity and option pricing in FX versus fixed income markets. This type of open dialogue permeates the whole firm, which is one of PGI’s 14 ‘boutique’ asset managers. In Finisterre’s open plan office, the other nine managers (and five strategists) can feed ideas into the macro UCITS strategy, and all have sight of each other’s positions, but no house view is imposed on any funds nor individual managers. “We can analyse situations, such as Petrobras, from many different angles – macro, micro technical – with the help of internal specialist teams,” says Lynch. Any of the managers, including Lynch and Lavigne, could have opposite positions and this is not just a theoretical possibility – it sometimes happens. “The day to day correlation among the funds and managers has been low and position overlap can in theory range from 0% to 100%,” Lynch illustrates. He and Lavigne each have discretion to execute trades – subject to oversight from CIO, Darren Walker, and, of course, the overriding constraint of the risk management framework. New team members at Finisterre have included Chief Risk Officer (CRO), Dr Thierry Pudet, who joined in 2015 and previously headed the Risk Team in Europe for Citadel. Dr Pudet leads a risk team of four staff and has dual reporting lines to both the CEO, Rafael Biosse-Duplan and, independently, to the Board of Directors. Risk management includes a cap on forecast Value at Risk (VaR). Finisterre’s internal VaR limit of 2.0% is well inside the standard UCITS level of 4.47% at the one day, 99% confidence level (which is analogous to the more frequently quoted 20% over a 20 day period). The metric is calculated using a two-year lookback period. Lynch recognises that “VaR limits underweight tail risk so we tend to have some degree of tail risk hedges in the form of a long volatility bias. Often, positive carry will help to negate the option cost. The Risk Team complements the VaR measurements with stress analyses.” The strategy is governed by hard stop losses, whereby pre-determined drawdown thresholds compel risk reduction and larger setbacks may require a manager’s portfolio to be temporarily liquidated. Yet the UCITS strategy has not yet, as of April 2017, touched the 3% month to date loss level that would require a halving of risk, despite the turbulent market conditions seen in early 2016, 2015 and those associated with the “Bernanke taper tantrum” in 2013/2014. Indeed, Finisterre are naturally well aware that the US Federal Reserve impacts emerging markets, but believe that the timing and quantum of (any) unwinding of QE is probably more significant than the speed of rate rises. “Rate hikes are already factored in and appear to be happening because we perceive the US economy is at or above potential, which is good for EM,” argues Lynch “but if the Fed ceases reinvesting coupons from its asset purchases, and then divests the principal rather than reinvesting it upon maturity, countries reliant on US funding could face some stresses,” he expects. However, as the macro UCITS strategy is not making any over-arching call on EM as an asset class, it is much more instructive to examine Finisterre’s views on individual regions, countries and currencies. A big picture view expressed by the strategy in late 2016 and early 2017 was that certain Asian countries’ monetary policy cycles – and bond markets – would decouple from those of the US. “As many Asian countries now trade more with each other than with the US, they need not follow the US in raising rates,” explains Lavigne. Finisterre has profited from owning fixed income in Taiwan, Thailand, India and Indonesia – and also garnered gains from short positions in US Treasuries. Indonesia, and Brazil were two of the strategy’s best performing country exposures in 2016. Indonesia was chosen to express the Asian decoupling theme because Lynch likes the structural growth story associated with President Jokowi’s agenda. Lynch points out that “the fiscal amnesty has prompted capital repatriation and structural reforms should promote growth and stability. The international community should start to view Indonesia as a first tier, developed emerging market, whereas its yield of 7.75% at the 15 year tenor still looks like a second tier, early stage emerging market.” Yet this is not primarily a carry play as hedging out the Indonesian Rupiah currency risk – at a cost of around 5% for the NDF – eats up most of the interest rate differential. Lynch anticipates capital gains from yield compression, partly because he reckons front-end yields of only 4.5% make the curve too steep. He also expects Brazil’s remarkably high real and nominal interest rates should come down, but for somewhat different reasons. “Social security and wage indexation reforms should relieve inflationary pressures and state owned banks should lend less at sub-market interest rates,” Lynch expects. In contrast to the currency-hedged Indonesian trade, in Brazil Lynch is happy to take on local currency risk and sees three forces supporting Brazil’s Real: “The FDI pipeline appears good; the balance of payments seems to be improving, and the central bank should soon stop buying dollars to replenish the FX swaps sold during the crisis.” If the Real has already had quite a rally, the Mexican Peso is a more contrarian trade where Lynch takes heart from US Trade Secretary Wilbur Ross’s utterances on it being undervalued. But as in Brazil, Mexico’s interest rates seem high: an 8% nominal rate and 4% inflation equates to 4% in real terms. The macro UCITS strategy is in a swap, receiving fixed rates and paying floating rates, which should profit from lower rates. Yet in developed markets Finisterre is generally trading fixed income from the short side, expecting higher interest rates in the US and Eurozone. The latter view is still somewhat non-consensus, but in the Czech Republic, Finisterre is merely heeding the central bank’s public statements. A short position in Czech rates demonstrates how shorts need not imply a pessimistic view on politics or economics. Lynch “is impressed by the strength of the Czech economy and the central bank is accumulating huge levels of reserves in order to defend the currency peg.” Finisterre is in fact more constructive than consensus on other European economies, in addition to the Czech Republic. “If you strip out the political risk around elections and the EU’s future, the ECB could surprise markets by raising rates, perhaps from 2019 onwards, or announce it is reducing QE. The ECB has an incentive to steepen the yield curve because the European economy is based on bank finance whereas the US is financed by capital markets. Europe’s economy will not grow without bank lending,” is Lynch’s conviction. The breadth of the strategy’s investment remit is not its only distinguishing feature. Readers might also be startled to see that the minimum investment, of $2 million, is clearly aimed at institutional investors who require, or prefer, UCITS, rather than retail investors, who are unable to access other funds. The genesis of the macro UCITS strategy in 2013 was a reverse enquiry from an existing insurance company investor that sought UCITS as a way to help address the Solvency II rules. The natural choice for Finisterre was to use its corporate parent, PGI’s, Dublin platform to structure the macro UCITS strategy. “We were conscious of the need to keep the total expense ratio down,” explains COO, David Burnside. Finisterre has received substantial allocations from private banks, which are keeping a close eye on fees. “The product is distributed to institutional investors in most of the major European markets – Italy, Spain, Switzerland, France, UK, some Scandinavian nations, and is tax transparent for the German market,” says Burnside. Finisterre is also starting to see investment activity in the macro UCITS strategy in key Asian markets, such as South Korea, territories where PGI has offices and deep client relationships on the ground. Investing through passive vehicles that provide indiscriminate exposure to entire asset classes is currently fashionable but Finisterre have always argued that the diversity of emerging markets demands a very active approach. Finisterre highlights the wide dispersion among over one hundred different countries’ political, economic, monetary and fiscal, policies and cycles, which give rise to divergent patterns of asset price performance and compelling opportunities for long, short and relative value trades. Even within the same country, interest rates, credit spreads, exchange rates and equity markets can move in opposite directions, which underscores the need for an unconstrained mandate that can construct trades expressing precise views on each element of each emerging market asset’s exposure.